Police on Wednesday released surveillance video of a man suspected of burglarizing a Concord convenience store of $5,000 in lottery tickets. 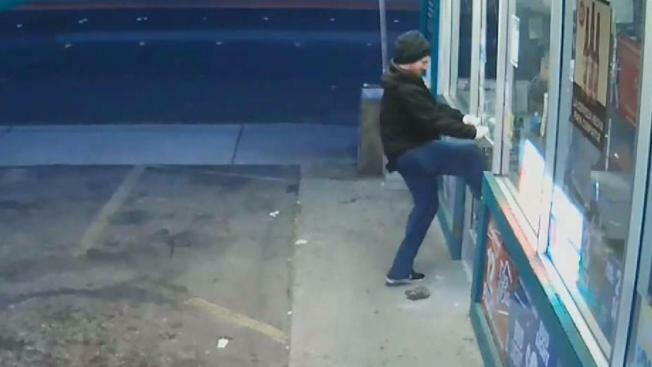 The suspect pulled, bashed and smashed his way into the store, where he damaged an empty cash register before making off with the tickets, police said. In a Facebook post, Concord police called him a "bumbling burglar" because he's seen in the footage pulling a door bar off and falling flat on his back and then losing his shoe while trying to kick through the glass door. Anyone who recognizes the suspect or has information about the burglary should contact Detective Tucker with the Concord Police Department’s Financial Crimes Unit at 925-603-5828.